The Historical Evidence - did it really happen? Over the past decade there has become a progressive passion of many, Christian and Jews alike, to learn and understand the life and ministry of the first recognized congregation (ecclesia) of messianic followers of Jesus. Were they like us, did they believe like we do? If not, then why not? It is recognized that the limited vision we have comes through the gospels of the canon, the synoptic gospels (Matthew, Mark and Luke), the Johannan Gospel, and the Acts of the Apostles attributed to the Apostle Luke. Did not their master, Yahshua (Jesus) achieve the reputation and respect, at the age of twelve, after the Feast of the Passover (Pesach) when his mother and father found him at the Temple sitting at the feet of the great Jewish teachers and scholars in Jerusalem? The Jerusalem Church (Yerushalayim Ecclesia) was recognized as the Mother Church of what would later become Christianity. In fact the whole concept of the Jerusalem Church is a misnomer, as in the culture of first century Judaism there were no churches. The various groups of Sabbath worshippers met together in congregations called ecclesias, worshipped in the synagogues or the Temple of Herod in Jerusalem. The Jewish followers of Jesus were called for the next few centuries, the Notzri, and the congregation of Notzris was called the Nazarenes. As such the official name for the Jerusalem Church was the Hebrew (Kahal) Nazarene Congregation (Ecclesia) of Israel (Yisra’el). Throughout this study, we will continue to appeal to the real name of the early apostolic followers of Jesus. They were truly the primitive Christians, but as we shall soon see, the primitive Christians were actually more educated and spiritually advanced than their descendants many centuries later. So is often the course of history, we, as historians and scholars in the modern world, found that we have an abundance of knowledge. Though our knowledge has truly increased, the depths of our understanding were more superficial. It does not have the multiple layers of spiritual and mystical meanings and understanding that was a part of the laminated mosaic of Jewish religious knowledge. This study is complex and not the simple story that I grew up to believe. It was an era when actors moved on and off the Jewish religious and political stage. During this era, religious and political parties merged, separated, re-affirmed and then denounced each other. We find a large corpus of literature representing each parties on multiple sides of an issue. In order to understand the full picture, we find heroes and traitors represented by the same person, depending on who was doing the writing and the judging. Any opinion a historian can make on this era will be denounced by some believers as evil, heretical, and fraudulent to the cause of Christ. The polarity of the Jewish people allowed no shades of gray and multiple shades of black. That polarity lives with us today as Christians and may even resurrect itself in this course of study. So we enter cautiously, prayerfully, yet with a hope that looking at the history of the era and recognizing that all human are affected by the political, spiritual and social events of their day, we can enhance and enlighten that era recognized as the birth of Christianity. So much of scholarship today is in reference to defining the question, did it really happen? Was the life of Jesus a historical event? The first area to look as has to be the context of time. It has been suggested that the life of Jesus was not an important figure in the Roman world and times. 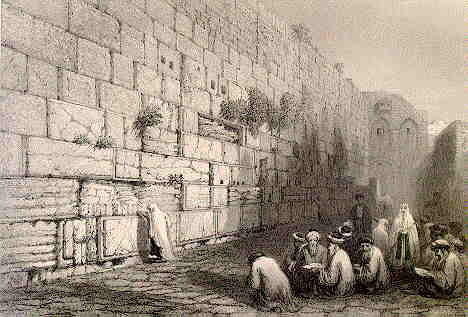 We must come to this study with the understanding that the Jews in the diaspora, living outside the province of Judea were in constant touch with their homeland, and traveled frequently back to Jerusalem to attend the feasts of the tabernacle as required by every adult Jewish male living in the land. The province of Judea was so strategically located that any unrest or revolt would quickly spread and could destroy the political stability of the entire eastern Roman Empire. There was an intense hatred against the Romans occupiers of Judea, known as the Edomites or the Kittim, by the Zealots or the nationalistic Jews, who were also known as those that were ‘zealous for the law’ and Sicarii. There passions based on their religious beliefs alone were always on the cutting edge of revolt. To them, Yahweh had forbidden the allegiance and worship to any other ruler and that included the Emperor of Rome. That the Roman citizens considered the emperor of Rome to be divine was only fuel for the fodder that recognized that this was blasphemy against the God of Abraham. Finally, Jesus came into earth’s history when the most intense fervor of messianic expectation occurred in Jewish life, including a long line of Davidian aspirants to the throne of David and the Hasmonean aspirants to the throne of the Maccabean rulers of Judea. 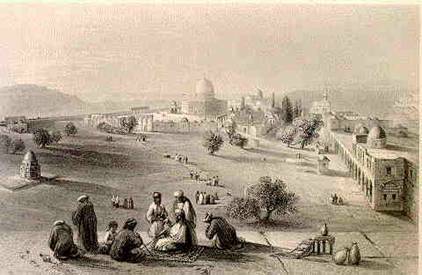 Jerusalem was the epicenter of one of the most dynamic centers of religious thought and passion in the ancient world. At the millennium and the onset of a new era, the largest and most massive temple complex in the Roman world was being completed, the Temple of Herod. The whole focus of the Temple cult was on the hope of a future Messiah and the apocalyptic entrance of the “kingdom of God” as seen by the emergence of an independent Jewish nation, ruled by a Messianic king which would usher in a new world of Peace and harmony for the whole world. For even to the Jew, this was a strange time to live. Their whole life was telescoped into an obsession that human history was coming to a climax that the cosmic battle of good and evil, light and darkness was finally to end. This was the high-water mark in a new form of religious thought, eschatology, or the study of events at the time of the end in which the world would end in a great apocalypse, ushering in a new world of piece. It is no wonder we are fascinated by this era for its similarities and affinities to our lives today are as apparent as multiple cultures and ideologies are competing for allegiance to their version of a coming world age. Even the geo-political forces of global government seeking to democratize the world into a ‘safer and more humane world’ is apart of this apocalyptic fervor of our present era. For the thoughtful, was God leading or was man taking history in his own hands and producing a self-fulfilling prophecy a portent of theirs and our own apocalyptic demise. Sadducees: The Sadducees, recognized as the official priesthood, were the central political and religious brokers that emerged from political oppression of the Persian rulers, the Seleucids and the Romans. The latter, a former ally, now became their oppressor. To them, it was the ‘political correct thought’ that it was better to work with the Romans who had brought them an international world of peace, the Pox Romania, in order to preserve the semblance of Jewish life and control. To them the Jewish Kingdom of God would be under the ‘control’ of the priest and the nobles. It was they who would control the moral authority of Jewish law and the purity of the Jewish faith. The wisdom of Jewish thought and the enlightenment that would emanate from the Temple service in the new and glorious Temple of Herod would vault Jerusalem as the rightful inheritor of the cultic, religious, center of the world. Controlled by a few families, they were elitist and aristocratic. Greed and corruption led to their wealth. To maintain their wealth and power, they were not only accomplices to Roman oppression but also became oppressors in their right upon their own people. They had a virtual monopoly of all functions and appointments in the services of the Temple. The vast revenues in the commercialization of the Temple sacrificial service gave great wealth to these families. It was this power, money and greed that alienated them from the Jewish peasants. It was their “large corporate management” in the buying and selling of the sacrificial animals that Jesus with righteous indignation called them a ‘den of thieves”. Those not within the employment of the Temple controlled the administrative and civic job sector in Judah. Theocracy to them came through the power of the mighty and cloaked with the ecclesiastical authority. They rejected the concept of divine intervention and as such, a messiah or redemption by divine cataclysm was a threat to their power and authority. As such they rejected the Resurrection and a future life. It was the Sadducees who were the responsible agents in the death of Jesus and it was they who proclaimed, “His blood shall be upon us and our children.” (Matthew 27:26) Jesus, considered by many to be the rightful King of the Jews, was a challenge to Rome and to Caesar and was a threat to Sadducean political power base. Jesus, driving out the money exchangers, and taking control as Priest of the temple service for forty-eight hours was a threat to their religious and economic power base when the temple revenues from the extortion and graft from the sale of the doves and lambs for the personal sacrifices dried up. For those two days during the Passover week, the population of Jerusalem, including the Essenes, the Zealots, and a large segment of the legitimate priestly class, were able to witness the “Kingdom of God” in real life and action. They did not see a military royal aspirant leading the Jews towards a revolt. They instead saw the “Son of God” reaching out for all His people in caring and love. When Herod’s Temple was destroyed in AD 70 and the central temple services were terminated, the Sadducees as a party ceased to exist. Pharisees: The Pharisees were the legitimate anti-thesis and the political and religious rivals to the Sadducees. As a close fraternity of teachers and instructors “in the Law”, they were the religious reformers in that day. The Sadducees controlled the Temple sacrificial service (and the income derived from it). The Pharisees controlled the religious thought, for their power base of authority was in the weekly synagogue service which became central core of Judaism. As such, they were anti-aristocratic and generally friends of the population. Their daily life and conduct demanded strict forms of sanctity. Their exactitude in tithe-paying, exaggerated and ostentatious prayers, their consuming details to the letter of the law earned them special rebuke by Jesus. They looked forward to a messiah of the lineage of David, the Moshiach ben David, who would be a strong proponent of the Law. This Messiah would restore a kingdom in which social justice would rule, the land of Israel would be redeemed with the arrival of the messianic era in which all the world would worship the God of Abraham, Isaac and Jacob and Israel would once again become truly the ‘light of the world’. As such, they believed in a resurrection and also in redemption. Though Jesus on occasion attacked individual concepts of Pharisaic thought, this can also be looked upon a legal jargon, not associated with personal animosity. As a group, they had a certain affinity with the message of Jesus. Scribes and Lawyers: The Scribes in Jewish life were the legal glue of Judaism. These were the legal professionals, the attorneys, in Jewish life. Like the Justices of the Supreme Court, they defended or attacked the various applications of the Mosaic Law, seeking to keep every nuance of life in legal conformity with the ancient writs of Jehovah. Many times associated with the Pharisees, these professionals were used by the Pharisees to provide their legal and religious challenges to Jesus. A careful study of the legal jargon and dialogue with Jesus has been likened to modern attorneys arguing over minute applications of the law, sometimes in acrimonious debate, yet they would walk out of court in friendly and professional banter. True professionals, they discussed issue oriented topics and usually did not mix them with personal attacks on an individual basis. On a personal basis, they could lean towards philosophically either to Sadduceism, Pharisaism, or Essenism. As such many Pharisees, scribes and lawyers were counted on as admirers in the life and ministry of Jesus. 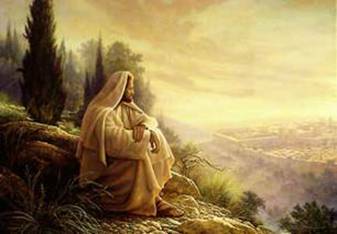 With their fervent belief in messianic ideals, many also accepted Jesus as the Messiah. Essenes: The tradition of the Essenes goes back to about 150 BC when the Chasidim, rebelled and split off from the Jewish hierarchy in protest to their secular accommodation with Persian and Roman authorities. They were the most mysterious of all the sects in Judea. Outside of Josephus and Philo, the early Christian scholar had very little documentation until the Dead Sea Scrolls were uncovered in the Qumran site near the Dead Sea. Qumran has now been accepted as a library and manuscript production site, and possibly their major headquarters. Hundreds of documents, scrolls and fragments have been discovered and catalogued on every book of the Old Testament except the Book of Esther. Also included were scores of books and commentaries outside the Old Testament Canon. What was even more revealing were the words and their meaning of their literature such as, ‘the poor’, ‘the meek’, the ‘four thousand’, the ‘five thousand’, the ‘elect’, which were used in the teachings and ministry of Jesus. They were a prophetic group with a defined apocalyptic mission. They felt they were to await the soon coming Messiah and to protect him when he arrived. The Essenes, about one hundred fifty years before Jesus’ birth, split as part of the Chasidim separatists, over the Sadducee party who were working as ‘accomplices’ with the Romans in the rule and security of Judea. To them, the Sadducee was a usurper of the role of the temple priests. To them the High Priest could only come from the descendants of the Levitical priestly line of Zadok, the appointed High Priest of King David. The Zadokians, according to some experts had set up a separate Temple service outside of Jerusalem, at Khirbet Mird, a Hasmonean Palace, which they claimed would be ministered by the pure line of Zadok temple priests. It was to the Essenes in the first century BC, that the messianic congregation of followers of Jesus (Yahshua) in the 1st century drew many of its major religious concepts such as the sacraments of baptism, the Eucharistic meal (Communion), role of the Devil, the roles of the angels in the heavenly hierarchy, the pervasive emphasis of the doctrine of dualism (war or conflict in heaven), the time of the end eschatology, the origin and nature of evil, the concept of progressive revelation, the adoption of celibacy and communism (commune society). ethnarch. At this time, a Roman Legate assumed legal authority over Judea. A census of persons and property brought a major revolt by Judas of Galilee and his associate Zadok. They were anti-gentile. They felt that they would be contaminated if they associated with them. Philosophically, they were akin to the Essenes and the Nazarenes and along with all who were Zealots for the Law and the preservation of Jewish ideology and their national identity, came to be known as the Fourth Philosophy. As activists, they were inflexible in their quest for national freedom, especially from Roman rule. They were willing to take to the defense of the Law with the sword. As such, they were the freedom fighters, the guerrilla, warfare fighters, and in the eyes of the Romans, terrorists. Simon the Zealot was a member of Jesus’ inner circle and as such, the cause of the Zealots was part of the messianic and apocalyptic message of Yahshua. Sicarii: The Sicarii were the radical ultra-right wing of the Zealots. Whereas the Zealots worked on a national scale and fomented revolt against the Romans, the Sicarii, took the revolution on a personal basis. They were named after the Sica, the saber daggers they kept hidden under their cloaks. As such, they were the assassin squads, seeking to eliminate those individuals who were most accommodating to the Roman rulers. Judas Iscariot was possibly known as Judas the Sicarii. Nazarenes: Jewish followers of Jesus were commonly called Nazarenes. This Greek word comes from the Hebrew Notsrim, meaning, Keepers or Preservers. Jesus was called; Jesus the Nazarene and Paul was rightfully accused of being a leader of the sect called Nazarenes. The followers of Jesus were initially identified as followers of the “The Way”. In Antioch in Syria, the Hellenized followers of Jesus were called ‘Christians’, about 50 AD. Yet for fifteen years, the hierarchy of the Jerusalem Church as identified in Acts of the Apostles, had so many features in common with the Essenes. The massive ‘converts’ who joined the church by the thousands during the Pentecostal revival, can only be understood in light that a majority of those in the Essene community were converted to the message of Jesus by Peter and John. The early primitive Christian Church inherited the legacy of the Essenes but not the sectarian separateness and the cultic secret society aspects of the calcified Essene movement found in the first century. The Baptists: those disciples of John the Baptist (an Essene) who would not accept Jesus as the Christ became what we were called the Mandean Nazarenes and the Simonites. The Zadokites, in the Zealot movement, and other Last-Day groups, “Way of the Law’ and the ‘Way of Freedom’ became splinters of an era of apocalyptic messianic seekers (Schonfield, Hugh Joseph, The Pentecost Revolution, The Story of the Jesus Party in Israel, AD 36-66, Macdonald and Janes’s, St. Giles, 49/50 Poland Street, London, W.I., 1974, p 282-287). As such, this author will identify the Jerusalem Christian Church under the leadership of James the Just, brother of Jesus, as the Hebrew Nazarene Ecclesia in Jerusalem. The followers of Yahshua were authentic Jewish believers to their core. They were Torah observing, Shabbat worshipping, temple worshippers, and festival observers from their infancy or early development onward. Peasants: The majority of the Jewish population was the peasants, who were willing followers and sought leadership in the major parties or sects. It must be understood that the major parties, only commanded at the most an estimated seven to eight thousand adherents each and the minor parties, Zealots and Sicarii, only in the hundreds. The peasants toiled unceasing in predominately agrarian labor. During the Sabbatical year, they had a year off from the toil of manual labor. As such, they had the freedom to follow whatever leader was in the area or the most prominent at the time. Most peasants were not ideologically oriented. What they did understand is whether a teacher or a leader appeared to understand their needs and cares. According to Jewish historian Hugh Schonfield in his book, The Pentecost Revolution, (Schonfield, Hugh Joseph, The Pentecost Revolution, The Story of the Jesus Party in Israel, AD 36-66, Macdonald and Janes’s, St. Giles, 49/50 Poland Street, London, W.I., 1974, chapter 3, Time Factors), he sets forth the thesis that the history of Jesus and the messianic movement of his later followers must be set in the historical setting which includes the understanding of the Sabbatical Passovers. According to the Mosaic Law, the soil in the land of Israel must lay fallow or uncultivated every seventh year and as such the peasants that were most closely associated with the agrarian culture of Judea were most affected. Every seventh year they were not able to plant their crops and had to live off of what was grown naturally or by native growth of the grains. That this Torah injunction was critically important to the Jews must be taken in light that the exile of the Jews to Babylon for seventy years was directly related that for seventy Sabbatical Sabbaths the Israelites had forsaken their covenant with their God and for four hundred ninety years, 70 x 7 years, the Sabbatical years were not followed. As such, the Lord of hosts put a curse upon the people and the land of Israel was allowed to rest for seventy years, while the Jewish people lived in Babylon and Persia. With the expectation that the agrarian farmers had to stockpile their provisions so that they could live for a year, the families and especially the males were free from their normal labor and could study under a special rabbi or many became involved in either religious or political foment that would erupt across the land. It there was a famine or locust plaque prior to this year, the hardship upon the people of the land would be severe. Such is the Lucian story (Acts 11:27-30), of the great famine in Judea in 40 CE, the year prior to the accession of Claudius Caesar to the emperorship of Rome. Out of this historical event comes the story in Acts. As we shall see later, the political ferment in a starving population in Judea during a drought led later to reprisal by Claudius Caesar and the forced expulsion of the Jews in 44 CE. This then caps the story of the Apostle Paul, moving from Athens to Corinth, met a certain Pontus Jews Aquilla and his wife Priscilla, who had just moved from Rome to Corinth “because Claudius had commanded all the Jews to depart from Rome.” (Acts 18:1) The fact that they were of the same occupation, tentmakers, only highlights another factor of biblical exegesis and history. Some scholars suggest that living in a coastal city; they manufactured sails for the sailing vessels of the Mediterranean. Looking at the Greek word for tentmaker, skenopoios (skay-noop-oy-oi) (Strong’s 4635), we find that it comes from the root, skenos (skay-nos) or a tabernacle for God as the body was a tabernacle for the spirit of God and skenoma (skay-no-mah) the Temple as the dwelling place of the Lord. This strongly suggests that instead of making tents, as this was not a Bedouin culture, they were making tallits or prayer shawls which represented to the Jews a tent to put over their bodies as they dwelled with the Lord in prayer. Looking over the historical events of Jesus, we find the first great public outcry that went across the land in the fall, 3 BCE to the fall, 2 BCE, the year after the death of Herod the Great. The birth of Jesus and the massacre of the children under two years of age in Bethlehem is placed in the historical milieu of an era of paranoid derangement of Herod as he killed his wife, children and any other potential claimants to his throne, including trying to kill a babe, born of the house of David, in which three magi from the Parthian provinces east of Judea were coming to worship. That the historian, Luke, knowing that Jesus was not older than two years of age, only would logically place the birth of Yahshua no earlier than the fall of 7 BCE and no later than the fall of 6 BCE. Also as stated by Jewish Historian Hugh Schonfield, according to the ancient custom for the Royalty Law and other passages from the Book of Deuteronomy to be read in the Temple on the first day of the Festival of Tabernacles, Sukkot, just after the close of the last day of the Sabbatical year. According to the Mishnah, these passages were read by King Agrippa and according to the Sabbatical years can now be dated to October 41 CE, after the close of the Sabbatical year from 40 to 41 CE. According to Sotah vii, 8, King Agrippa read, remembering that he was not fully Jewish, cried while he read, “You are not to set a foreigner over you who is not your brother”, while the crowds shouted ‘You are our brother, You are our brother.” From this date we can now determine the date of the rise of Augustus Caesar. (Schonfield, Hugh Joseph, The Pentecost Revolution, The Story of the Jesus Party in Israel, AD 36-66, Macdonald and Janes’s, St. Giles, 49/50 Poland Street, London, W.I., 1974, p ). 3-2 BCE - Sabbatical Passover - 2 BC - The year following Herod’s Death. The first Roman Census – 6-7 CE by Quirinius, Governor of Syria. The process of the Roman census taking has now been documented by a papyri uncovered in Egypt. It documents the rise of Judas of Galilee and a band of zealots who rose against the Romans because they were taking a numbering of the Jewish according which was illegal according to the laws of the Jews. (Schonfield, Hugh Joseph, The Pentecost Revolution, The Story of the Jesus Party in Israel, AD 36-66, Macdonald and Janes’s, St. Giles, 49/50 Poland Street, London, W.I., 1974, p 50 ). 30 CE - The Model for a Spring, 30 CE, Crucifixion of Jesus – The crucifixion of Jesus would have occurred on the High Sabbath, which was recognized as the Passover Shabbat. This day literally could have occurred on any day of the week. This date according to the literal text of scripture should occur in the midst of the literal seven day week cycle, yet it could also have occurred in the midst of the week of the Jewish Sabbatical Year from the Jewish New Years in the fall of 26 CE to the fall of 34 CE. As such this model for the date of Jesus’ death on the Passover of 30 CE meets two different criteria of the prophecy of Daniel that the sacrifices and oblations would cease in the midst of the week and the prophecy of Jonah, in which Jesus laid in the bowls of the earth for three days and three nights. This date for the crucifixion would also have put Jesus to death forty years before the fall of Jerusalem to the Roman legions of Vespasian in 70 CE. According to the traditions of the Jews, after the death of Jesus, the hierarchy of the temple priests became more and more aware that the sacrificial system within the temple was corrupted and not accepted in the eyes of the Lord of hosts. Note what the Talmud states occurred at the time after the death of Christ. Within the traditions of the Jews may come the best indicators for the death of Yahshua. Assuming the death of Jesus at 30 CE, forty years before destruction of Jerusalem and the Temple, the omens that were reported during those years forty years can now be appreciated. We must also comprehend the political consequences of the actions of Caiaphas and the Sanhedrin presiding over the illegal trial of Jesus in the Chamber of Hewn Stones in the Temple leading to His subsequent death on the tree. From that date forward, the Sanhedrin moved to the Trading Station. Yet using the solar equinox cycle to determine Passover in which Yahshua died cannot be determined by a solar calendar, for the actual date of the Passover was not determined by the spring equinox but by the religious lunar calendar of the Hebrews. Using the spring equinox as the date calculation was non-Jewish and was instituted by the 3rd century Roman orthodox church in order to set the date for Christian festival of Easter Sunday. According to the Mosaic Law, the date of the Passover celebration would occur on the 15th day of Abib after the first sliver of the moon was sighted over Jerusalem after the first ripened barley was found in the fields around the base of the Mount of Olives. Advocates of the 33 CE date for the crucifixion of Jesus and the slaying of the Passover (Pesach) lamb on the 14th day of Nisan so that the pilgrims could celebrate Passover on the 15th of Nisan, would truly have appeal to a Sabbatarian (Seventh-day Sabbath) worshipper, yet it was not compatible with Mosaic Law. The High Sabbath as spoken in the Book of John was the Sabbath of the Passover festival and once every seven years could have fallen on the seventh-day Sabbath. If Jesus was literally crucified and stayed in the tomb for three days and three night according to the prophecy of Jonah, then a the 33 CE model in which the crucifixion of Jesus would have fallen on Friday would not be compatible. This date would also not be compatible with the ‘in the midst of the week’ prophecy which could have been a literal week or the ‘week of years’ on the Sabbatical year. The Third Roman Census occurred in 34-35 CE. 34 CE - The Model for a Spring, 34 CE, Crucifixion of Jesus – The crucifixion of Jesus would have occurred on High Sabbath that literally could occurred in the midst of the week and occurred on the Passover on the Sabbatical Year that occurred every seven years. Yet the High Sabbath according to the Torah and Jewish law was not the day the Passover landed on the Seventh-day Sabbath, but actually the High Passover Sabbath could land on any day of the week. On the other hand according to the solar calendar used by the Essenes in the first century CE, the Passover occurred on Wednesday evening. What gives this date particular appeal is that the last year of Jesus’ ministry, it was the Sabbatical Year, the land was not cultivated and all the peasants in the land were able to follow Jesus and participate in His ministry. This would give further insight into the Galilean ministry with vast throngs of people and the social unrest that was fomenting in the land just prior to the upcoming third Roman census between the Jewish New Years in the fall of 34 and the fall of 35 CE. The Third Roman Census of 34-35 CE followed. – According to Jewish historian Hugh Schonfield, the census papers have been located for this year. (Schonfield, Hugh Joseph, The Pentecost Revolution, The Story of the Jesus Party in Israel, AD 36-66, Macdonald and Janes’s, St. Giles, 49/50 Poland Street, London, W.I., 1974 p. 50). 47-48 CE - Third Sabbatical Passover - The Great Famine in Judah occurred in 46 CE. Paul returns to Jerusalem with money for the poor in Jerusalem and was subsequently imprisoned following riots in the Temple court. 75-76 CE - Seventh Sabbatical Passover abolished - Temple destroyed and Jewish Passover as a temple rite in Jerusalem was ended. The Roman governors over Judea came about the year 6 CE in the form of procurators when the son of Herod, Archelaus was banished. As we shall see later, the Procurator was eventually given custody over whole area of what would eventually be known as Roman Palestine after King Agrippa died in 44 CE. The Procurator was essentially independent though politically joined to Syria, who was under the authority of a Roman Legate. The geo-political forces that would swing back and forth in Judea and Galilee would be very dependent upon the strength, wisdom and stability of the Roman Procurator and how politically allied the High Priest in Jerusalem would be to the Roman Procurator. Only the Roman provinces that possessed a civilization that were more antiquated than the Roman themselves received the semi-autonomy of having their own Procurator. Those selected for this position of governance usually came from the ranks of the Roman knights. A notable exception was Felix who lived in the Praetorium or the former palace of Herod, whom Paul presented his case after the riots against him in the Temple of Herod, was once a freeman who was appointed procurator of Judea. Yet this was due mainly that his brother Pallas was the secretary of the Roman treasury under Claudius Caesar (41-54 CE) and Felix was also married to a Jewish princess, Drusilla. Yet if the Procurator did not abide by the wishes of Rome, that is especially to appease the population, keep a stable political organization so the land would be productive (for taxes to Rome) and safe, then the Legates of Syria would have to step in and impose rule from a high level of Roman authority. Vitellius, the Legate of Syria did such a thing in 36 CE when Pilate (26-36 CE) was deposed and later the Legate Quadratus sent Ventidius Cumanus the Procurator, between 48-52 CE, went to Rome to give account of his actions before the Caesar whereupon he was banished. Between 6-41 CE, the procurator ruled over only the Roman province of Judea, who along with the Syrian legate had the power to supervise the activities of the Temple of Herod and the authority to appoint or depose the high priest. 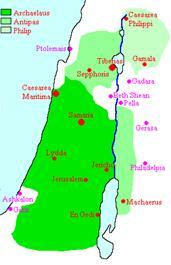 For three years, 41-44 CE, the authority reverted back to a Jewish governorship under King Agrippa I. 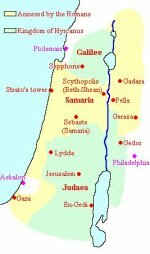 Then the Procurator again assumed the rulership after 44 CE not only over Judea but also Samaria and Galilee between the years 44-70 CE. Yet during this later period, the high priests and the supervision of the Temple of Herod were given to the authority of the Jewish princes of the Herodian family dynasty. Born the son of Antipater from Idumea, the rulership of Herod was predicted by an Essene named Menahem. Herod the Great began the great dynasty that ruled over some part of present day Palestine until the fall of Rome in 70 CE. The death of Herod was in 4 BCE and the next year was the celebration of the Sabbatical Passover. 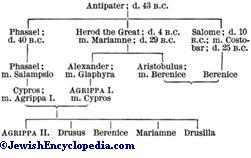 Born in 23 BCE, the son of King Herod the Great the Great and Malthace, Archelaus was the full brother to Herod Antipas and half brother to Philip. Though according to the will of Herod the Great upon his death he was entitled to the title of the King of Judea, Augustus Caesar informed him that he could only assume the title of Ethnarch ( ‘national leader’) of Judea, Samaria and Idumea. The accession of King Archelaus was met quickly with resistance and the golden Roman eagle over the entrance to the Temple was pulled down by two popular Jewish teachers, Judas and Matthias. On March 13, 4 BCE, they plus their students were burned alive in Jerusalem with massive throngs of angry Jews. The ensuing revolt of the Passover of 4 BCE was eventually quelled with three thousand Jews killed. From there Archelaus quickly went to Rome to be crowned by Augustus Caesar. While away new revolts erupted by Judas the son of Hezekiah, Simon of Perea, and Athronges the Shepherd and the Roman forces under the command of the Roman legate of Syria, Publius Quinctilius Varus had to come down and suppress the revolts because the forces the forces of Archelaus were unable to suppress them totally. Into this political unrest the Apostle Matthew frames the story of the return of Joseph and Mary with the babe, Yahshua, in which they were afraid to return to the land ruled by the Herod Archelaus (Matthew 2:22) and thereby settled in the province of Galilee. The rulership of Archelaus was so inept that both the Jews and the Samaritans appealed to Caesar. It finally took another bloody revolt this time by Judas the Galilean over the Roman taxation which is behind the story of the Second Birth ceremony of Jesus in 6 CE. Archelaus was finally deposed in 6 CE to Vienne in Gaul in central France and died about 18 CE. Archelaus' troops were unable to cope with them, and the Roman governor of Syria, Publius Quinctilius Varus, had to intervene. Two thousand people were crucified, but not all leaders were caught. Ultimately, Archelaus came to terms with one of Athronges' brothers, something that will not have made a good impression. Matthew implies that Jesus' parents Joseph and Mary were afraid to go to the territories ruled by Archelaus, and therefore settled in Galilee (Matthew 2.22). During his governorship, Augustus Caesar died on August 19, 14 CE. During his tenure, it was the first time that the Procurator arbitrarily appointed and deposed the high priests in the Temple of Herod. Vitellius visited Jerusalem for the first time at the Passover festival in 36 CE. (Josephus, Antiquities Book XVIII) During this visit, he gave many concessions to the Jewish people, including remitting taxes on the sale of agricultural products and appeasement’s to the Jews by allowing them to keep the high priest vestments in the Temple. The high priest Caiaphas was deposed for his acts of improper management of the Roman interest to pacify the Jews rather than incite the zealots in the land of Judea. The zealot uprisings at the time of the crucifixion of Yahshua and even the surreptitious handling by this Machiavellian of Jewish politics by placing the blame of Yahshua’s death in the hands of the Romans did not sit well with the Caesar of Rome. Jonathan Ananias, the son of Annas was installed as high priest in the office held by Caiaphas. When Vitellius returned to Jerusalem in the fall of 36 CE he quickly deposed Jonathan Ananias as the high priest and Theophilus, son of Annas was installed as High Priest. Marcellus, Overseer of Judea (36-37 CE). Marcellus was a personal friend of Vitellius and was authorized as a subordinate official to render an account of the political events occurring in Judea. As such Josephus did not call him a Procurator by an ἐπιμελητής or an overseer. No Roman Appointee: Spring, 36 to fall, 37 CE - The Roman Census was completed 34-35 CE and the Jewish society was upset and restless due to the imposition of taxes after a Sabbatical Passover Year. Pilate was banished in 36 CE due to his undue force and unjust governorship. No procurator was appointed and Vitellius was to assume Roman authority over Judah. He appointed Jonathan Ananias son of Annas to be High Priest on his visit to Jerusalem during the Passover, 36 CE and gave power of defacto rulership as he was involved in preparation for war with the Arabs who had beat Herod. From the Passover, 36 CE to the Pentecost, 37 CE when Vittelian returned to visit, Jonathan had full reign to take revenge on the infant Nazarene (Jerusalem) Church. This led to the stoning and Death of Stephen, the Deacon in 36 CE. Agrippa I assumed the rulership of Judea when he was 51 years old. A Herodian by birth and a Hasmonean by his grandmother, he was first sent to Rome for education at the age of six and became close friends with the son of the talented son of Tiberius Caesar, Druses Caesar. He lived the life of luxury and splendor found only by one accustomed to the court life of the imperial court of Rome. With the untimely death of Druses in the year 25, Agrippa found himself suddenly out of favor with the Roman court life. Yet with the assistance of his sister, Herodias, who two years later married the tetrarch Herod Antipas, found an appointment for him as the market overseer in Tiberius in Galilee. Unable to get along with his brother-in-law he resigned and for the next decade underwent many adventures until 36 CE, he came to the attention of the heir apparent to the throne of Caesar, Gaius Caligula. Not careful with his political rhetoric, in the company of others in the royal court, he wished for the day when Caligula would assume the throne of Rome. When this came to the ear of the austere Tiberius Caesar, he suddenly found himself in prison until the death of Tiberius in 37 CE. Gaius Caligula Caesar, the new ruler of Rome thanked his friend, Agrippa I, brought him out of prison and gave him the appointment to the tetrarchy of his Uncle Philip and also of Lysanias and the title of king, along with the Senate rights and title of praetor. His sister, now envious also of her brother, wanted the title of king for her husband Herod Antipas and by right the title of queen to herself. It was Agrippa I who intercepted this message with the veiled suggestion that Herod Antipas was harboring ideas of treason and independence. Herod Antipas was destroyed and the districts of Galilee and south Perea were transferred to King Agrippa I.
Gaius Caligula Caesar with the appointment of Petronius as the legate to Syria planned to install a statue of himself as the deity of the Romans in the Temple of Jerusalem. King Agrippa I sought to mediate in this crisis but before the final orders could be acted out, Caligula was murdered by his own body-guard, Cherea. Claudius Caesar, grateful to the services of Agrippa I, placed the territories of Samaria, Judea and Idumea which were governed by Archelaus under his rule in 41 CE. Observing the consequences of evil passions, oppression and uncontrolled passions in the lives of ruler, Agrippa I grew into a ruler of moderation and control. The Jewish people, though he was part Jewish through his grandmother, the Hasmonean princess, Marianne and part Idumean through his grandfather Herod the Great, the Jewish people learned to love him for he would celebrate like any commoner and carry his basket of first-fruits to the Temple of Herod in the Feast of Tabernacles and would appeal the heavy Roman taxation of his people to Rome. Under his rule, prosperity appeared to return to the land of the Jews. Early in his rulership, he was suspicious and paranoid of any Jewish rivals to the throne and those who had contact with Jewish nationalist who had feelings of animosity towards leaders of Judea that were accommodating to the Romans. 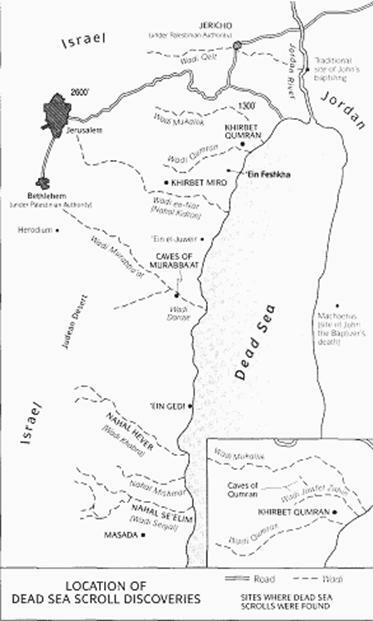 During the massive influx of Jewish pilgrims to Jerusalem during the Sabbatical Passover festivities in 41 CE, we also find the return of the Apostle James the Greater, the brother of the Apostle John, who had ties to the priestly families, coming back to Jerusalem after almost a decade in the Roman provinces of Spain and Sicily. Soon after James returns to Jerusalem to meet at the Sabbatical Nazarene Council with the other apostles that were evangelizing the world, found him suddenly thrust into prison and beheaded by King Agrippa I. Soon after this, the Apostle Peter also found himself in prison but was miraculously released by white cloaked emissaries and quickly made exit of the land of Judea. The next place we find the Apostle Peter is in the home of the Senator Pudens in Rome in 44 CE. Then at the opening ceremonies of the Roman Olympiad Games held in the coliseum at Caesarea in 44 CE, he suddenly died in the prime of his youth, apparently the victim of poisoning by the geo-politics of his Roman enemies. The Jewish followers of the Hebrew Nazarene Ecclesia in Jerusalem felt the death of King Agrippa I was by divine intervention and the oppression of the Nazarene Ecclesia soon ceased. No Roman Appointee: 44 CE - Joseph of Arimathea and the Bethany family were banished from Caesarea by the Sadducee leadership after the death of King Agrippa I until the Roman Legate was able to come down to Rome. This lack of Roman protection for Joseph of Arimathea, a Roman Decurion, led to the immediate evacuation of the Bethany family to Caesarea to the home of the Apostle Philip. Understanding the nature of the Sabbatical Passovers and their relevance to the Jews, it is imperative of any historian into the history of the Hebrew Nazarene Ecclesia of Jerusalem to understand how the history of the apostolic ecclesia merged with the High festival season that occurred in the land every seven years. Allen, J.H., Judah’s Sceptre and Joseph’s Birthright, an analysis of the Prophecies of the Scriptures in regard to the Royal Family of Judah and the Many Nations of Israel, the Lost Ten Tribes, Destiny, Publishers, POB 177, Merrimac, Mass. 01860, 1902. Arnold, Eberhard, The Early Christians, a sourcebook on the witness of the Early Church, Baker Book House, Grand Rapids, Mich, 1926. Azhar, Ahmad Din, Christianity in History, Sh. Muhammad Ashraf, Kashmiri Bazar, Lahore, Pakistan, 1968. Ibid, The Messianic Legacy, Bantam Doubleday Dell Pub Co., 1540 Broadway, NY, 1986. Bede, The Ecclesiastical History of the English People, Oxford University Press, NY, 1969. Capt, E. Raymond, MA, AIA, FSA, SCOT, Missing Links Discoveries in Assyrian Tablets, Artisan Sales, POB 1497, Thousand Oaks, CA 91360, 1985. Capt, E. Raymond, MA, AIA, FSA, SCPT, commentary, The Lost Chapter of Acts of the Apostles, Artisan Sales/Hoffman Printing, POB 1529, Muskogee, OK 74402.1937, 1982, 1993. Ibid, Jacob’s Pillar, a Biblical Historical Study, Artisan Sales/Hoffman Printing, POB 1529, Muskogee, OK 74402.1977. Charles, R.H. D.Litt., DD, The Book of Enoch or I Enoch, Oxford at the Clarendon Press, Oxford, England, 1912. Crossan, John Dominic, Jesus, a Revolutionary Biography, Harper Collins Pub., 10 East 53rd St., New York, NY, 10022, 1994. Ibid, The Birth of Christianity, discovering what happened in the years immediately after the execution of Jesus, Harper Collins Pub., 10 East 53rd St., New York, NY, 10022, 1989. Ibid, The Essential Jesus, what Jesus really thought,, Harper Collins Pub., 10 East 53rd St., New York, NY, 10022, 1994. Ibid, The Historical Jesus, the first comprehensive determination of who Jesus was, what he did, what he said., Harper Collins Pub., 10 East 53rd St., New York, NY, 10022, 1992. Collins, John J. Rutledge, 11 New Fetter Lane, London EC4P4EE, 1997. Davies, J.G. The Early Christian Church, Barnes and Noble, 1965, 1995. Davies, W.D., DD, FBA and Louis Finkelstein, Louis D.Litt, DHL, The Cambridge History of Judaism, Cambridge University Press, Cambridge, New York, 1989. De Haven-Smith, Lance, The Hidden Teachings of Jesus, the political meaning of the Kingdom of God, Phanes Press, POB 6114, Grand Rapids , MI, 1994. Eisenman, Robert and Michael Wise, Barnes and Noble Books, 1994. Ellerbe, Helen, The Dark Side of Christian History, Morningstar Books, POB 4032, San Rafael, CA 94913-4032, 1995. Forbush, William Byron ed., Fox’s Book of Martyrs, a history of the lives, sufferings and deaths of the early Christian and Protestant Martyrs., Clarion Classics, Zondervan Publishing House, Grand Rapids, Michigan, 1926, 1954. Furneaux, Rupert, The Other Side of the Story, Cassell and Company Ltd. London, England, 1953. Gardner, Laurence, Bloodline of the Holy Grail, Barnes and Noble Press. 1996. Gawler. Colonel J.C., keeper of the Crown Jewels, Dan, the Pioneer of Israel, his early enterprise, his settlements, and connection with the Scythians., 1880, Artisan Sales/Hoffman Printing, POB 1529, Muskogee, OK 74402.1984. Gibbs, Ray, The Legendary XII Hides of Glastonbury, Llanerch Enterprises, Felinfach, Lampeter, Dyfed Wales, 1988. Ginsberg, Christian D. LL.D, The Essenes, Their History and Doctrines, Longman, Green, Longman, Roberts, and Green, London, England, 1864. Gray, Andrew D.D., The Origin and Early History of Christianity in Britain, Artisan Sales/Hoffman Printing, POB 1529, Muskogee, OK 1973, 1990. Goard, Rev. William Pascoe LLD, FRGS, FRES, The Post-Captivity Names of Israel, Artisan Sales/Hoffman Printing, POB 1529, Muskogee, OK 74402.1989. Haberman, Frederick, Tracing our Ancestors, Artisan Sales/Hoffman Printing, POB 1529, Muskogee, OK 74402. Haskins, Susan, Mary Magdalene, myth and metaphor, Harcourt Brace & Co., 6277 Sea Harbor Dr., Orlando, Fl., 32887-6777, 1993. Hassnain, Professor Fida, A Search for the Historical Jesus, from Apocryphal, Buddhist, Islamic & Sanskrit Sources, Gateway Books, The Hollies, Wellow, Bath, BA2 8QJ, U.K., 1994. Johnson, Paul, A History of Christianity, Touchstone Book, Simon & Schuster Pub., Rockefeller Center, 1230 Avenue of the Americas, New York, NY, 10020, 1995. Joseph, Bernard, and Bahadur Chand Chhabra, Shastri, Prabhakara, The ABC of Christianity, Ashoka Maurya and Pallava Historical Trust, No. 167-B, Mahatma Gandhi Road, Pondicherry, India 605001, 1977. Josephus, Flavius, The Complete Works of Josephus, including the Life of Flavius Josephus, Antiquities of the Jews, and Wars of the Jews and others. Translated by William Whiston, A.M.,, Kregel Publications, Grand Rapids, Michigan 49501,1981. Kamal-Ud-Din, Khwaja, The Sources of Christianity, The Basheer Muslim Library, The Mosque, Woking, 1924. Kamil, Jill, Coptic Egypt, History and Guide, The American University Cairo Press, 113 Sharia Kasr el Aini, Cairo, Egypt, 1997. Larson, Martin Alfred, The Essene Heritage or the Teacher of the Scrolls and the Gospel Christ, Philosophical Library, 15 E. 40th St. New York, NY 10016, 1967. Lewis, Lionel Smithett, St. Joseph of Arimathea at Glastonbury, James Clarke & Co., Ltd, POB 60, Cambridge, CB1 2NT, 1922, 1955. Lost Books of the Bible and the forgotten books of Eden, World Bible Pub., Inc., 1926, 1927. Malmesbury, William of, The Antiquities of Glastonbury, tr. Frank Lomax, Facsimile Reprint, J.M.F. Books, Llarerch, Felinfach, Wales, 1992. Martial, Martial’s Epigrams, Book 1, 2, 3. Transl. By Walter C.A. Kerr, Harvard University Press, Cambridge, MS. 1919, 1990. Monmouth, Gregory of, The History of the Kings of Britain c.1135, Penguin Books Ltd, 375 Hudson St. New York, NY, 1966. Morgan, R.W., St. Paul in Britain, Artisan Sales/Hoffman Printing, POB 1529, Muskogee, OK 1984. Motylewski, Leo F., The Essene Plan, Philosophical Library, Inc., 15 East 40 street, New York, NY 10016, 1976. Price, Dr. Randall, Secrets of the Dead Sea Scrolls, Harvest House Pub, Eugene, OR 97402, 1996. Seventh-day Adventist Bible Commentary, Vol 5, Matthew to John, Review and Herald Publishing Co., Washington DC, 1956. Schonfield, Hugh Joseph, The Passover Plot, Bernard Gets Associates, 130 East 56th Street, New York, NY 10022, 1966. Ibid, The Pentecost Revolution, the story of the Jesus Party in Israel, AD 36-66, Tonbridge Printers Ltd, Peach Hall Works, Tonbridge, Engl. 1974. Ibid, Those Incredible Christians, Bernard Gets Associates, 130 East 56th Street, New York, NY 10022, 1968. Schure, Edouard, The Light of the Mysteries - Jesus, Rudlf Steiner Publications, 151 North Moison Road, Blauvelt, New York, 10913, 1971. Skeats, Rev. Walter W. Joseph of Arimathie, the Romance of the Seint Graal or Holy Grail. AD 1350, Llanderch Publishers, Felinfach, Lampeter, Dyfed, Wales, initially publ. 1871. Skotes, H.F. Scott (formerly Mayor of Glastonbury), Glastonbury Abbey during the Crusades (Extracts from Adam of Domerham), 1934 ed., Llanerch Enterprises, Felinfach, Lampeter, Dyfed, Wales. Stough, Henry W., Dedicated Disciples, Artisan Sales/Hoffman Printing, POB 1529, Muskogee, OK 74402.1987. Starbird, Margaret, The Woman with the Alabaster Jar, Mary Magdalene and the Holy Grail, Bear & Company, Santa Fe, NM, 1993. Szekely, Edmond Bordeaux, Origin of Christianity, The Essene School of Life, 1943. Ibid, The Essene Gospel of John, First Christian’s (Essene) Church, 1968. Tacitus, The Annals of Imperial Rome, tr. Michael Grant, Penguin Books, 375 Hudson St., New York, NY 10014. 1956, 1996. Taylor, John W., The Coming of the Saints, Artisan Sales/Hoffman Printing, POB 1529, Muskogee, OK 74402. 1985. Helles Avenue, Moorebank, Australia, NSW 2170, 1993, 1998. Thomas, J. Llewellyn FRCS, The Assyrian Invasions and Deportation of Israel, Artisan Sales/Hoffman Printing, POB 1529, Muskogee, OK 74402.1937, 1989. Vermes, Geza, The Dead Sea Scrolls in English, Penguin Books, 375 Hudson St., New York, NY 10014. 1962, 1995. Williston, Walker, and Richard Norris, David W. Lotz, and Robert T. Handy, A History of the Christian Church, 4th Ed., Charles Scribner’s Sons, New York, 1918, 1959, 1970, 1985.